For the Venezuelan TV host, see Chiquinquirá Delgado. Location o the municipality an toun o Chiquinquirá in the Boyacá Depairtment o Colombie. 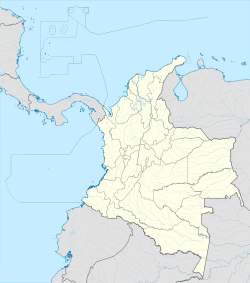 Chiquinquirá is a toun an municipality in the Colombie Depairtment o Boyacá, pairt o the subregion o the Wastren Boyacá Province. Locatit some 115 km north o Bogotá, Chiquinquirá is 2570 m (8432 ft) abuin sea level an haes a yearly average temperatur o 58°F. Chiquinquirá is constitutit bi twa zones: the urban zone or toun that is formit bi approximately 40 neebourheids atween the strata 1 an 4, an the landwart zone that is dividit in 17 sub zones locatit aroond the ceety. Chiquinquirá is considered tae be the releegious caipital o Colombie. It is hame to the Basílica de Chiquinquirá, that houses the image o the Virgen de Chiquinquirá, the patroness saunt o Colombie. Chiquinquirá is a major point o releegious pilgrimage. ↑ "Alcaldía de Chiquinquirá - Boyacá". Gobierno en Línea.net. Retrieved 30 August 2011. This page wis last eeditit on 11 Mairch 2018, at 09:42.